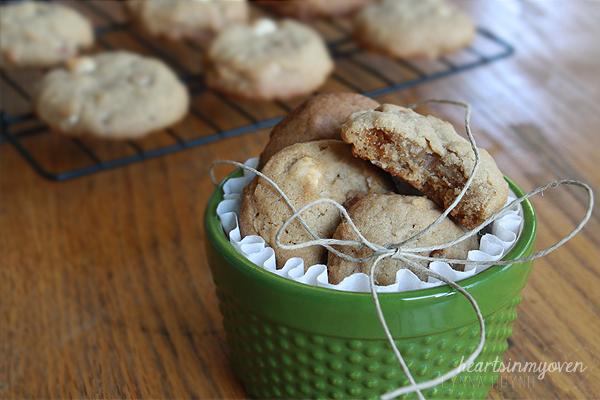 The name of these cookies seem like a mouthful, but it`s only because they are so wonderful. :) Haha. I`m definitely posting this week later than I had planned. I`m on my second week of my last quarter of college and it`s been pretty busy with my fraternity`s rush events, so I`m sorry!! It`s ending this week, so the craziness will end soon. My Google Reader is telling me I have about 650 unread posts of blogs I follow. I am definitely behind, which makes me sad, because I miss reading the wonderful blogs I follow! 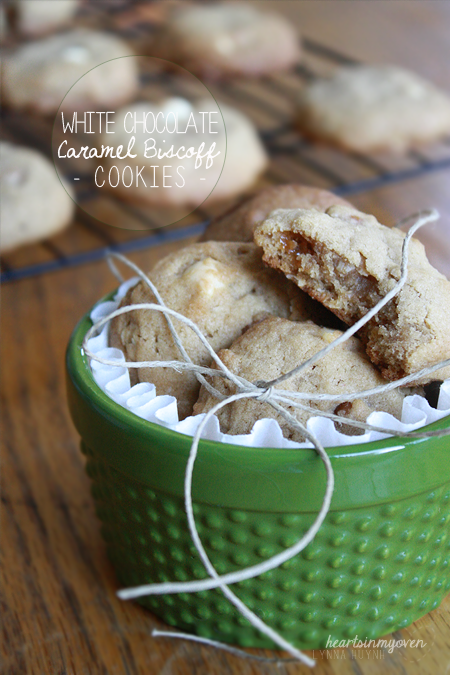 I love the combination of white chocolate and caramel with the Biscoff flavor. I added a small amount of oatmeal to add texture, but not enough to make it an oatmeal cookie. I love crunchy everything, so I always have Biscoff crunchy spread in my pantry, but the regular creamy spread will work just as well. As much as I am a fan of cookies, I like baking in small batches, so this recipe yields about 19 cookies (using my medium cookie scoop). If you plan on making more, just double the recipe. 1. Line baking sheet(s) with parchment paper or baking mat. 2. In a large bowl whisk together flour, baking soda, cinnamon, salt, and oatmeal. 4. Add the egg and vanilla extract and mix until combined. 6. By hand, using a spatula, add in the white chocolate chips and caramels. 7. Chill dough in the freezer for 15-30 minutes. 8. Preheat oven 350°F when you're ready to bake. 9. Using a medium cookie scoop, scoop dough into balls and place onto baking sheet with about 2 inches space in between each cookie. 11. Let the cookies stay on the baking sheet for about 5 minutes before removing to cool completely on a cooling rack.